Our full-time "nomadiversary" was February 1st and marks two years of full-time RV travel! If you missed our year one recaps, you can find months 1-6 here and 6-12 here. We've decided to just do them annually now, so the next one will be in 12 months. Google Maps refused to plot all the year on a single map, so it's split here in three. We ended up staying unusually many nights at a spa resort due to bad luck with both Ane's teeth and our diesel engine. It did feel good to pamper ourselves, though. We're not counting Xscapers convergences as paid camping; they're about the event not about the dry camping site. As before, the mpg is a very rough guesstimate because diesel pumped doesn't mean diesel burned — we don't track when the tank is full and when empty, and that can cause up to 150 gallons to be accounted for in a different year. Also, the generator uses some of the diesel, even if we rarely run it. Oh, and we apparently had a leaking fuel pump for a while, so count some of that diesel as being spilled on the ground. We traveled through Washington, Oregon and California this year, and paid probably $500 extra due to higher diesel prices on that route. Running at Bonneville Salt Flats. 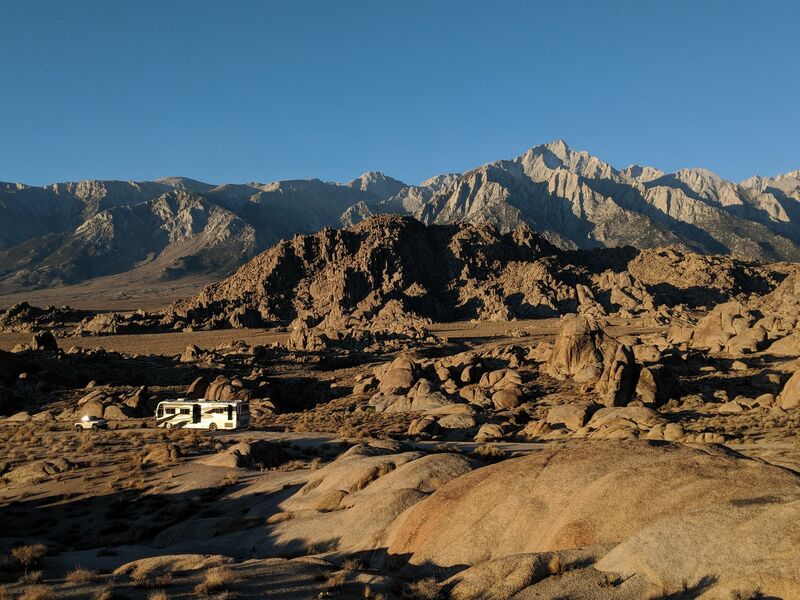 Boondocking at the Alabama Hills. Another highlight from 2018 was finally visiting some hot springs! These were near Mammoth Lakes, CA and we were able to enjoy them with some of our Xscapers friends. The saying goes, "The only thing that ALWAYS works on an RV is the owner", which Tommi will attest is true. He did countless smaller projects, but our only major issues this year were a cracked windshield and a leaking fuel pump. A pickup truck going the other way on a 2-lane road kicked up a rock and made a circular crack in our windshield right in front of the driver. It was bound to happen at some point! Our insurance covered most of it so it really wasn't a big deal, and the repair guy came to the campground we were staying at. The fuel pump was more of a headache, as we noticed the issue before a holiday weekend which strung out the time it took to get it fixed. Luckily we were an hour's drive to a good repair facility, and besides handing over more money than expected, we now have a brand new fuel pump and all is back to normal. Finished off the Western US! We had a hole in our map of the US when it came to the West... Washington and Oregon! We were finally able to fill that in this year. In 2 years we have traveled to 12 states: the entire west, plus Texas. 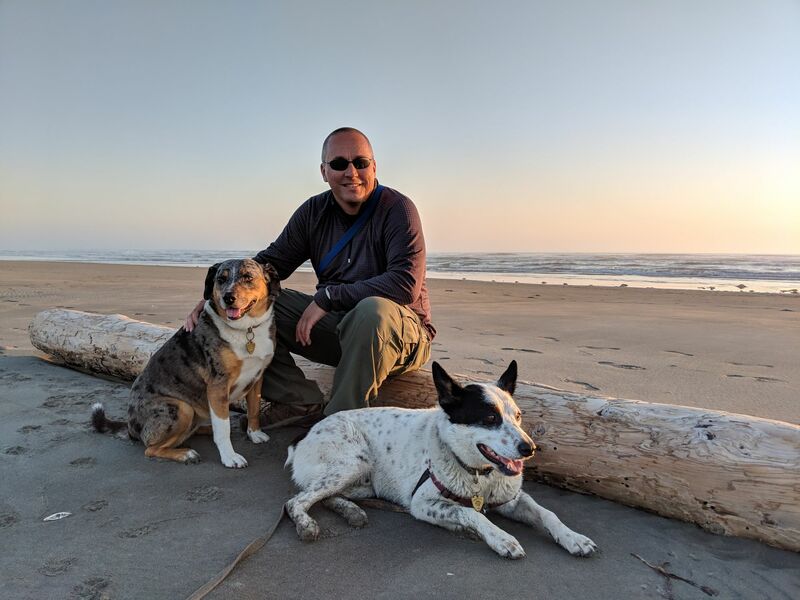 We strolled the beaches of the Washington coast for miles! Emptied out our storage unit! We now have everything we own with us in the RV. Funny, the things you save and then when you go back a year later you realize you didn't need to be paying $64/month to store it. Oh well! Lesson learned! Which is a good and bad thing! Good because it's always nice to have more money coming in, but bad because it limits our adventure time and days we can drive. We always used to drive mid-week to arrive at a new location when it was emptiest, but now since Ane's schedule is a traditional M-F, we find ourselves driving on weekends. Not the end of the world, but an adjustment. 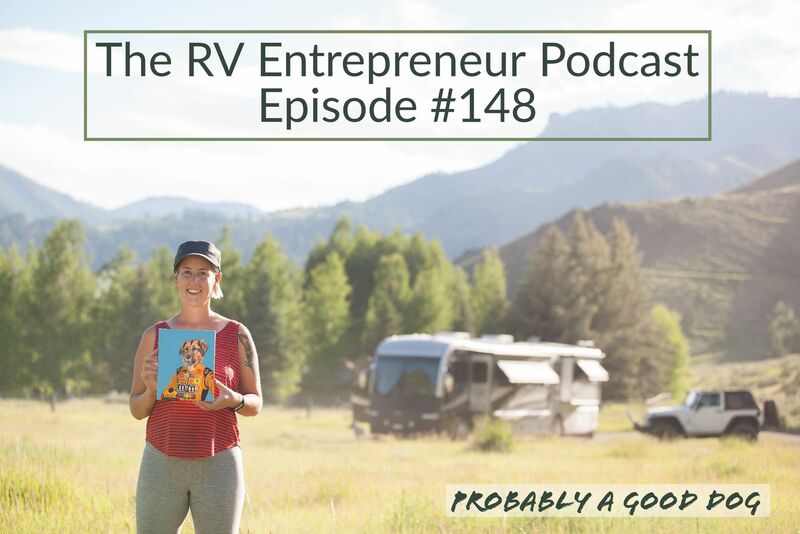 Ane's painting business was featured on the RV Entrepreneur Podcast! Ane's pet painting business got some huge press this year! A huge honor since and she really felt like she "made it" because this was the podcast she listened to as we hit the road and she was considering starting her Etsy shop. You can listen to her episode here. As we've done in the previous recaps, we solicited questions on Facebook and Instagram. "You're still fairly young. Do you ever think one day you'll want to settle in a home again?" When we started out, we shook hands on the plan to try it for two years and see how we feel then. Now, we're in complete agreement that there is no planned end to this adventure. It seems we'd only stop traveling if we simply had to, for example for work or health reasons. Interacting with retiree RVers around us, we've become more and more convinced that doing this while we're still "young" (healthy enough) means the world. Being able to hike even strenuous trails means we get to enjoy our travels much more. 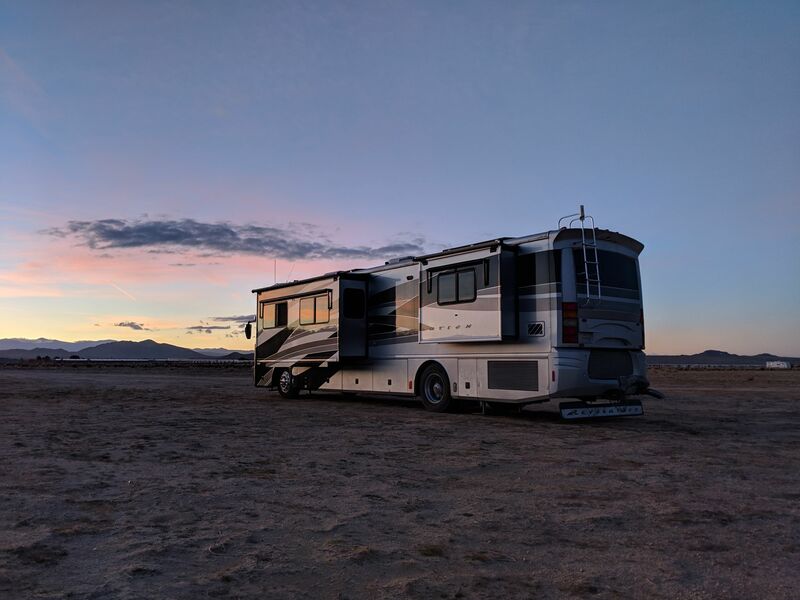 Being able to crawl inside the RV bays, lift heavy things, and fix things when they break makes this life more affordable. Once kneeling, lifting a 5 gallon water jug, or climbing on the roof become too hard... well, we'll see what remains of the adventure then. How do you do your food purchasing, storage & meal preparation? We covered dog food on the blog already, so let's talk human food. Our grocery shopping habits haven't really changed much. We have periods of trying to eat extra healthy mixed with eating for pleasure. If we could, we'd probably buy and eat the same stuff we did before RV life. The kitchen in this RV is large enough that we don't prepare food differently because of it. Storing food is more of a challenge, everything is stacked and hard to find and moves around when we drive. Buying fresh produce is near impossible in more remote areas. The food brands available keep changing as we travel. Getting lost in a grocery store is routine: we rarely visit the same grocery store more than twice. Not yet, but it's in the plans for 2019! We marked the GPS location, so we know exactly where it should be, but given the poor state it was in when we planted it, we don't have high hopes! Either way, we will give Instagram an update when we have one. What has been your best experience being on the road? Our experiences tend to blur together in memories. We often can't remember where we saw what — or even where we lived four weeks ago! The general sense of living out in the nature, far from city noises, with clean air, continues to bring us so much joy. Being able to start a hike with off-leash dogs right from the campsite makes any trail great. We'll stay in the warm southwest deserts for a month or two, and then start to work our way north. In early April, we'll be enjoying the beauty of Moab, Utah with our Xscaper friends. From there, we hope to add stickers for Nebraska, South Dakota and North Dakota to our travel map this year. We'll also attend our first FMCA rally in Minot, North Dakota in August! What's on tap for Lily GoodGirl & Mushy Fastpants? Lily is embarking on another year of keeping Tommi safe (it's a full-time job which she takes very seriously). In her spare time, she's excited to chase bun-buns in 3 new states. 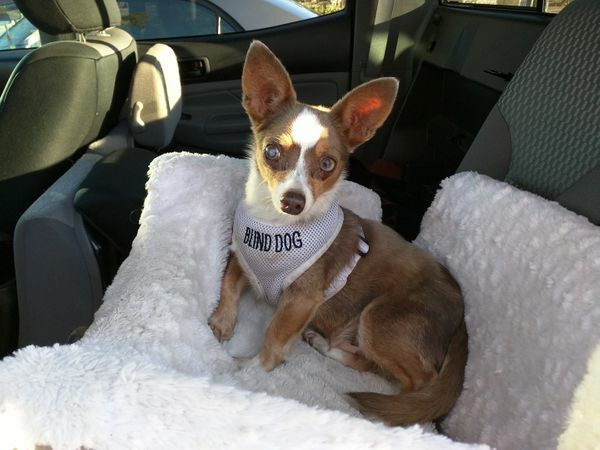 Mushy is looking forward to summer, where the sun sets later in the day, so he can clock more hours as an outdoor dog. 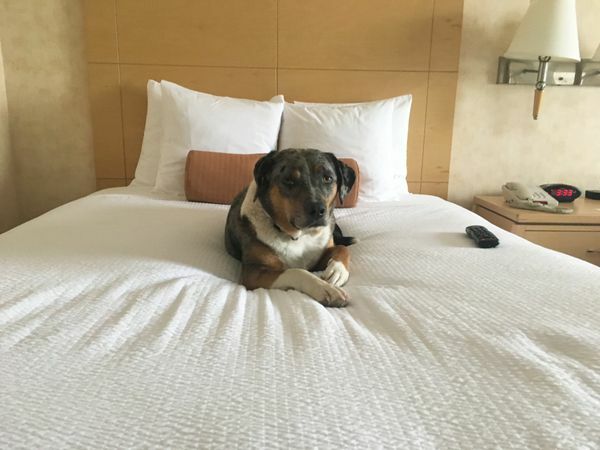 He's a true "outdoor dog" at heart and is happiest when he's chilling in his basement apartment under the RV, or on a comfortable pet bed enjoying the view. We also hope to build on Mushy's swimming progress he made last summer. We picked up a dog life jacket for him and are hoping that boosts his confidence to work on his doggy paddle. 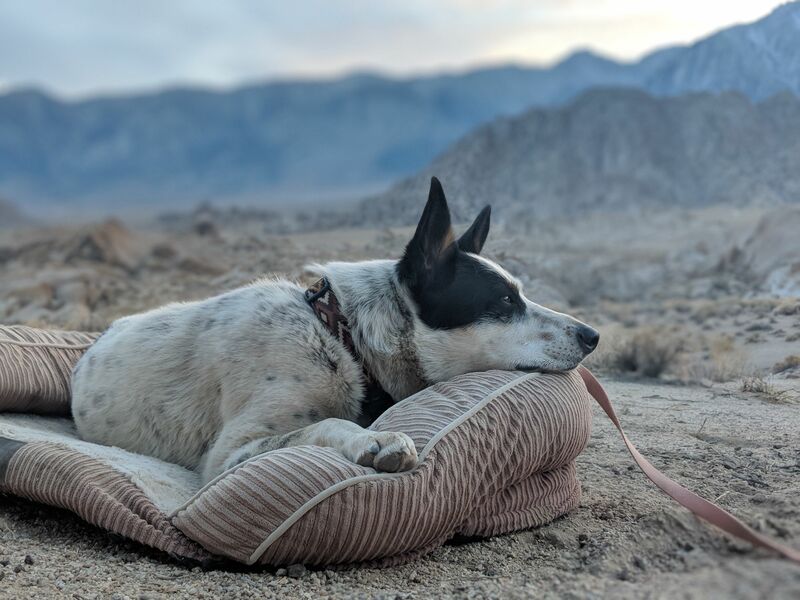 Living his best life at the Alabama Hills in California. Have a question we didn't cover? Send us a DM on Instagram and we'll answer in a Story and tag you!